It is important for homeowners to be aware of signs that suggest it’s time for furnace repair. 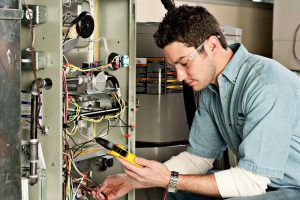 If a furnace experiences any of the following issues, it is highly recommended that the homeowner contacts a qualified professional to correctly diagnose the problem and take the steps necessary to fix it. Strange noises coming from a furnace indicate a problem. These sounds include, screeching, clanking, banging, and rattling. In most cases, the noises will begin and stop with the starting and stopping of the furnace itself. A loud screeching sound is likely a sign that the blower motor in the furnace is not working properly. This is the mechanism responsible for circulating warm air throughout a home. Clanking suggests a serious problem with the furnace’s blower wheel. If this is the case, homeowners need to turn off their furnace immediately and contact a professional to prevent further damage. Banging noises coming from a furnace suggest a dirty burner. The noise is caused by a delay in ignition due to dirt and build-up. The gas builds up, and when it ignites, a small explosion occurs inside the furnace. Homeowners should never assume rattling is just a symptom of a loose screw. Broken heat exchangers can cause a rattling sound. A broken heat exchanger can be extremely dangerous, as it can lead to a carbon monoxide leak. When a furnace produces less heat, its noticeable. A loss of heat is indicative of several potential issues, such as clogged burners, faulty ductwork, or a lack of fuel (depending on the fuel source the furnace uses). Homeowners should not attempt to diagnose issues themselves. Attempting to diagnose and fix a problem can be dangerous, so it is best to leave it to a qualified professional. Once the furnace is working correctly, heat should be restored to the home. When a furnace is not working correctly, homeowners can expect a rise in heating bills. An increased heating bill is a sure sign the system is not functioning optimally. When a furnace needs repair, it must work harder to circulate warm air throughout a house, thus making it less efficient. A lack of efficiency means paying more for heat. How? When a system is efficient, most of the fuel being used becomes heat for the home. However, when efficiency decreases, homeowners begin paying for wasted fuel while receiving less heat. For quality furnace repair, contact Yost & Campbell Heating, Cooling, and Generators—experts since 1939.